Welcome to the University Center for Ambulatory Surgery. We are committed to answering your questions and helping to keep you informed and involved in your care. During your treatment, you will progress through 4(four) phases of care. Below is a description of what you will experience in each phase. Please feel free to ask us questions along the way. We want to make your experience with us less stressful and be with you every step of the way. In this phase, you will be asked to verify pertinent information that ensures proper identification of yourself, and your Medical Doctor. We will ask for a copy of your insurance card, and a photo ID. Reading glasses and or hearing aids may be helpful during this process. After your registration process is completed, you will be asked to be seated in our waiting room until called by our clinical staff to proceed to the next phase. In this phase, we will prepare you for your procedure. Space is limited and privacy is very important to All of our patients, therefore, family members will be asked to wait in the waiting room (unless otherwise indicated by clinical staff). During this phase, you will be asked to change into a gown. Females of childbearing age will need to provide a urine sample for pregnancy testing. Your nurse will start an IV. 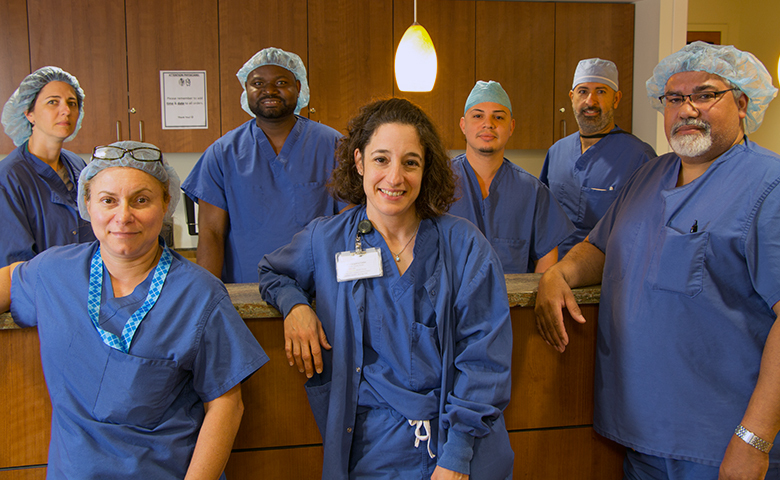 Various members of our clinical staff including Surgeon, Pre-op Nurses, Operating Room Nurses and Anesthesiologist will ask you questions about your present medical history. This is standard protocol, we want you to receive the best care and ensure your safety. When the operating room is ready for you, your Operating Room Nurse will take you into one of our three Operating Room Suites where your procedure will be performed by your surgeon. The length of your recovery phase will vary from 30 minutes to approximately 3 hours depending on your procedure and your response to anesthesia. The expected time of recovery varies with each individual. Patients are allowed a limited number of visitors in order to protect our patient’s privacy and noise level in the recovery area. No Children under 12 years old are permitted in the recovery area. When you are ready for visitors, The Recovery Room Nurse will bring your visitor to you. Your pain level will be diligently monitored and treated. Your comfort is important to us. We will provide you with a snack, assist you with dressing for home, and explain your instructions for care at home following your procedure. We thank you for the opportunity to participate in your care. We will contact you by phone the next business day after your procedure. We would like to know how you are doing and hope you will not consider our call an inconvenience. A pre-op nurse will call you the day before your procedure to review any pre-operative instructions. You are not to eat or drink anything after midnight the night before your procedure. This includes water, candy and gum. A pre-op nurse will instruct you regarding your arrival time to the center. You will need to make plans to have a responsible adult drive you home and assist you for 24 hours after your procedure, unless otherwise instructed by UCAS. Notify your doctor and UCAS of any medications you are currently taking. Follow medication instructions given to you by your doctor and UCAS. Bring with you: health insurance cards and photo/picture identification. If you need special assistance or require a language interpreter, please let your pre-op nurse know so we can make arrangements for you. Leave at home all jewelry and other valuables; UCAS is not responsible for any lost or damaged property. Bathe or shower the morning of or the night before your procedure to assure skin is rid of all makeup, lotions, creams and oils. We recommend using an antibacterial soap. You may also be given a special scrub protocol by your doctor. Remove nail polish from at least one finger on non-operative side. The skin and nails provide important signs of circulation. Dress comfortably in loose-fitting attire. Before Surgery, you can play an important role in your health. Since skin is not sterile, you can reduce the number of germs on your skin by carefully washing before surgery. You should take TWO showers: the FIRST shower the evening before surgery and the SECOND shower the morning of surgery. 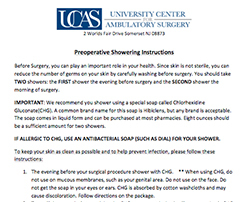 To keep your skin as clean as possible and to help prevent infection, please download and follow the preoperative showering instructions. Once your procedure has been completed, you will rest in the recovery room under the care of specially trained nurses. Your anesthesiologist will monitor your progress and our staff will answer your questions. Our nurses will go over postoperative instructions with you and the person accompanying you. You will receive a written copy of the postoperative instructions to take home with you. You must have a responsible adult drive you home and assist you for 24 hours after your procedure. Rest the day of your procedure, and then increase activity as tolerated or as directed by your doctor. One of our nurses will call you on the next business day to make sure you are recovering comfortably. For life threatening emergencies call 911. For all other questions and concerns call your doctor’s office. Remember to call and schedule your follow up appointment with your doctor. Regional anesthesia is the injection of a local anesthetic (like novacaine) near the nerves that sense pain from the area of your body that had surgery. Regional anesthesia is the same as a dentist injecting local anesthesia into your mouth – it numbs an area of your body, so that procedures won’t hurt. What should I expect after regional anesthesia? After regional anesthesia, the area of your body that had surgery will be numb for several hours. In fact, the area may be numb for up to two days. The block will wear off slowly and your first sensations will be a tingling feeling in the area that was numb. Because the same nerves that feel pain also cause your muscles to move, you will not be able to move that part of your body while it is numb. What should I do when the block starts to wear off? As soon as you develop any feeling in the numb area, begin taking the pain medication that your surgeon prescribed. It is much easier to treat the pain before it begins instead of trying to catch up later. What should I be careful about after regional anesthesia? Because part of your body is numb, you won’t know if you injure it. You should take care to protect that part of your body from being bumped, cut, etc. and you should look at it frequently to make sure it isn’t injured. You should also avoid applying ice or a cooling device directly on your skin while it is numb (over a bandage/dressing is fine). Don’t lie on the numb area while you sleep. Also, if your leg is numb wear your brace and don’t walk on it until you regain full sensation. What complications should I watch for after regional anesthesia? The site of where the injection was made will be sore for a few days. This pain should go away with any over the counter pain medicine (Tylenol, Advil, Motrin, etc.). It is not uncommon for the area that was numb to have some strange sensations (mild numbness, tingling, “pins and needles”, etc.) for a few days after the block.